Betway is running an eSports promotion with exciting missions to complete for a total reward of €20 in free bets every week! Complete missions – earn free bets – repeat every week! Between every Monday and Sunday, you’re able to earn yourself free bets with a total value of €20 while eSports betting with Betway. On the start of every week, three missions will be presented on their campaign page that will reward you with free bets upon completion. These missions changes every new week, but could for instance include one where you’re supposed to place eSport bets with a total value of €25 to receive a €10 free bet. There are a total of three missions to be completed every week, which must be completed in a certain order to receive the free bet reward from all of them. All you have to do to take part of each week’s €20 in free bets is to visit Betway, opt in to the promotion at their campaign page and fulfill the requested missions. Visit Betway and start earning free bets! 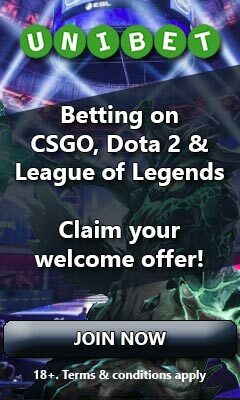 Betway is a great place for anyone who is into some serious eSports betting, especially so if you prefer placing your bets on Dota 2, League of Legends or CS:GO. They do an awesome job covering matches from on-going tournaments and have a wide selection of entertaining markets to choose from. You’ll also find a customer support that is always available through live chat, e-mail and phone; an interactive cash out option and a mobile app for iOS and Android. On top of this, Betway is perfect for combining eSports betting with other types of gambling as they have a wide range of products, such as casino games, bingo and even poker. If you wish to know more, you can read the full Betway review here. Professional eSports player – A future dream job? Betspawn – Competition with €400 in free bets! Betspawn – €5 free bet with no conditions!